Plus, Bournemouth and AC Milan are both understood to be interested in signing Jack Wilshere on a permanent contract. 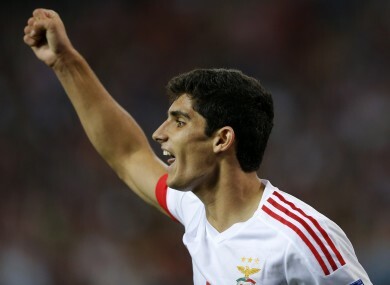 Benfica's Goncalo Guedes is being linked with a move to Man United. Man United are reportedly considering a move for 20-year-old Benfica winger Goncalo Guedes, who is valued at around £26 million (€30 million). United also continue to ponder a bid for Benfica defender Victor Lindelof. The 22-year-old is valued at £38m (€44m) and could join the Red Devils in the summer. Wayne Rooney could be set for a big pay day, with the England captain likely to be offered £700,000 a week by Chinese Super League champions Guangzhou Evergrande. Everton want Chelsea’s Branislav Ivanovic, with Phil Jagielka potentially moving to Sunderland as a consequence. Liverpool’s Lazar Markovic could be set to go on loan to Hull City, having failed to impress in a temporary spell at Sporting Lisbon. Bournemouth and AC Milan are both understood to be interested in signing Arsenal midfielder Jack Wilshere on a permanent contract. Irish-qualified striker Scott Hogan looks finally set to complete a big-money move from Brentford to West Ham. In all Newcastle’s ill-advised signings over the years, the £5.7m (€6.6m) purchase of Xisco has to be up there in terms of notoriety. Bought from Deportivo La Coruna after a less-than-convincing record of 12 goals in 44 appearances for the Spanish side, the former Spain U21 international made nine appearances and scored once over a five-year period. After underwhelming loan spells at Deportivo and Racing Santander, he was released by the Magpies and joined Spanish second division side Cordoba, where his appearance and goalscoring tally improved considerably. In 2016, he joined his current club — Thai outfit Muangthong United FC. Email “United eye €30m Benfica winger, Rooney ponders China and all today's transfer gossip”. Feedback on “United eye €30m Benfica winger, Rooney ponders China and all today's transfer gossip”.